Another artist's conception of the X-33, this time after engine shutdown. 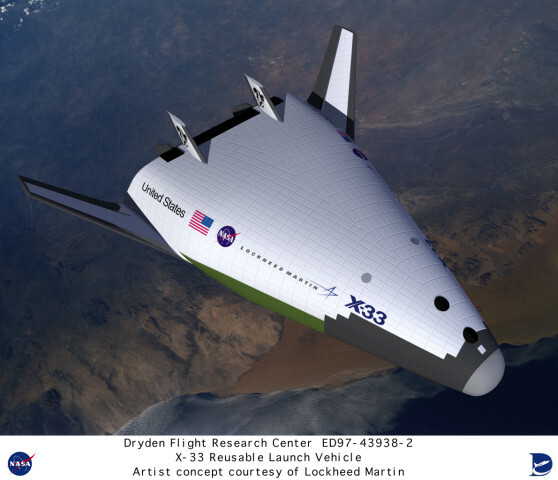 The vehicle is shown gliding toward its landing site in the southwestern U.S. The X-33 was undertaken to demonstrate the technologies required for a full scale, single-stage-to-orbit launch vehicle. The goal was to substantially reduce the cost of putting payloads into orbit. This proved elusive, and for a variety of reasons, the X-33 was cancelled in February 2001.